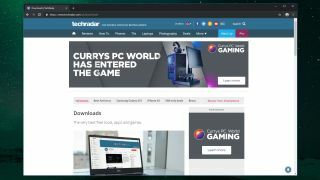 We recently learned that Google Chrome for Windows 10 will soon be getting its own native dark mode, which will make the browser respect the dark/light preferences you've chosen in Windows' settings. We don't know when dark mode will be released (though it's possible that it will be later this month), but if you can't wait, the team at TechDows has discovered a way to force it right now. To try dark mode, you'll need to start by installing Chrome Canary. This is an experimental version of the browser that Google uses to test new features before rolling them out more widely, and developers can use to see how their sites will work with future versions of Chrome. It's a very handy tool, but it might contain bugs, so we wouldn't recommend making it your main browser – particularly for anything that involves sensitive information like banking or shopping. Once you've downloaded and installed Canary, right-click on the desktop icon and click Properties. Select the Target field and, after \chrome.exe", type a single space followed by --force-dark-mode. Click Apply, followed by OK to save the change. Next time you open Chrome Canary, it will start in dark mode. You can revert to the standard white design by simply removing the extra text from the Target field. As TechDows notes, this isn't necessarily exactly what the final Chrome dark mode will look like (we'd be surprised if the menus are so hard to read in the final version), but it will give you a feel for it.